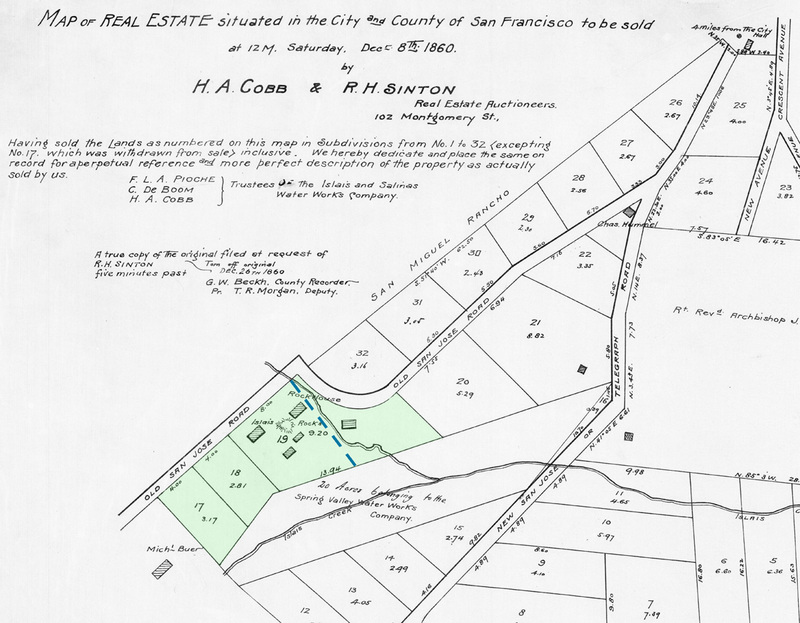 Once the site of a landmark rock so large it merited its own mark on early maps, there was an area of rich farmland used for growing food and raising animals into the 1920s located just east of Sunnyside and south of the present Glen Park Bart Station. It is now lost under the kilotons of concrete that make up the I-280/San Jose Ave interchange. 2017 OpenStreetMap altered to show area of ranch/vegetable gardens. The 1861 Wackenreuder map shows the rock itself. 1861 Wackenreuder map, altered to show location of area, green, and Old San Jose Road in yellow. when it still went through present Glen Park. North is at top (rotated from original). View whole map. The enormous rock that provided a landmark about five miles from downtown was probably removed in the course of the grading and construction of the railroad to San Jose in the mid-1860s; the last map we have found with the rock marked is dated 1869, but it may not be accurate. A portion of the Cobb-Stinton map, 1860. Thank you to Chris Dichtel for passing this to us. View whole map. Blue line denotes where ranch land will be divided in 1891 (more below). This land was nestled between the creek from Glen Canyon, the creek from Sunnyside, and the main Islais Creek that both creeks fed into. Map below from Joel Pomerantz’s work mapping the lost waterways of San Francisco (SeepCity.org). There was a long history in this area of dairy grazing and vegetable farming before and even after early development; there was plenty growing for cows and goats to graze on, and a good supply of water available from wells that dug into the munificent Bay Watershed. Adapted from Seep City Almanac, with ranch/gardens area marked green and old waterways marked blue. Creek on left originated on south side of Mt Davidson; creek on top from Glen Canyon. In 1891 a portion of Rock Ranch on the northeast was sold off to a speculator named Moses Salomon. He divided it into lots and filed his homestead called Salomon’s Portion of Rock Ranch with the City. 1891 Homestead map for Salomon’s Portion of the Rock Ranch. SF History Center. View larger. Salomon then sold these lots during the 1890s and early 1900s. Two of many real estate transactions ads for Salomon’s Portion of Rock Ranch lots, 1890s, in the SF Call and SF Chronicle. At the time of the 1915 Sanborn map, the larger portion was still planted as “vegetable gardens” and probably leased to Italian management and workers. There were three small buildings on the land, shown in photos below. 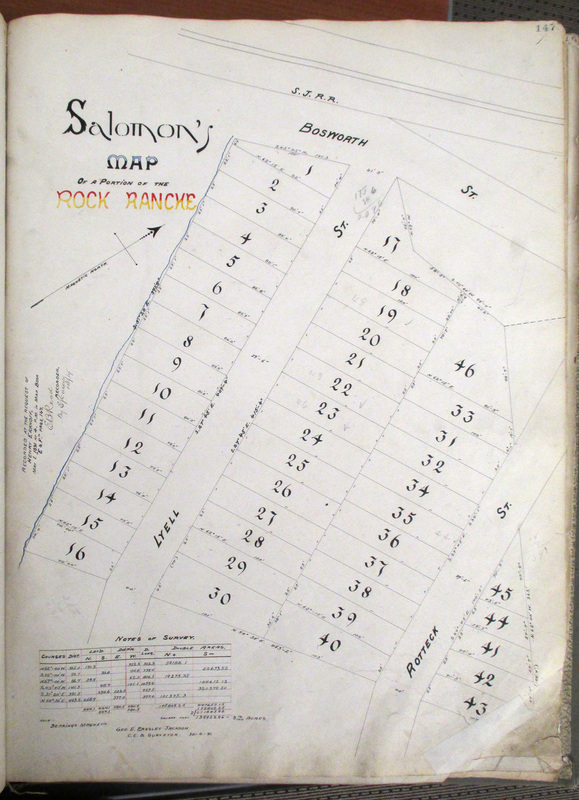 1915 Sanborn map, sheet 920. altered to show planted area. tiny lettering vertically oriented in this area says “vegetable gardens.” Garden Lane will be later renamed Gorham Street. View larger. By 1927 the widening of the Bernal Cut for auto traffic was finished, and this sliced off the northwest edge. The farm buildings shown in the photos above were demolished. “Salomon’s Portion” was being built up with houses. 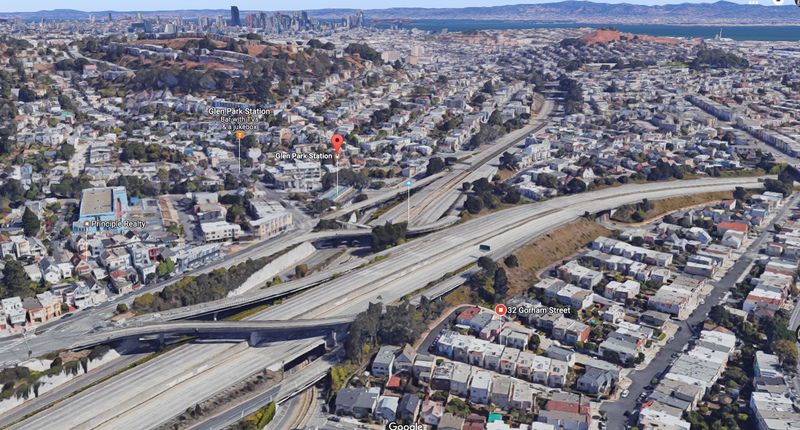 After the widening of the Bernal Cut, and creation of Bernal Ave, next to line of Southern Pacific tracks. Taken soon after completion in 1927. If you could just turn to the left, the once-vegetable gardens would be visible. But these of course were not of interest to the photographer. Courtesy Western Neighborhoods Project. Clumsy labeling on original. 1938 aerial photo, altered. DavidRumsey.com. 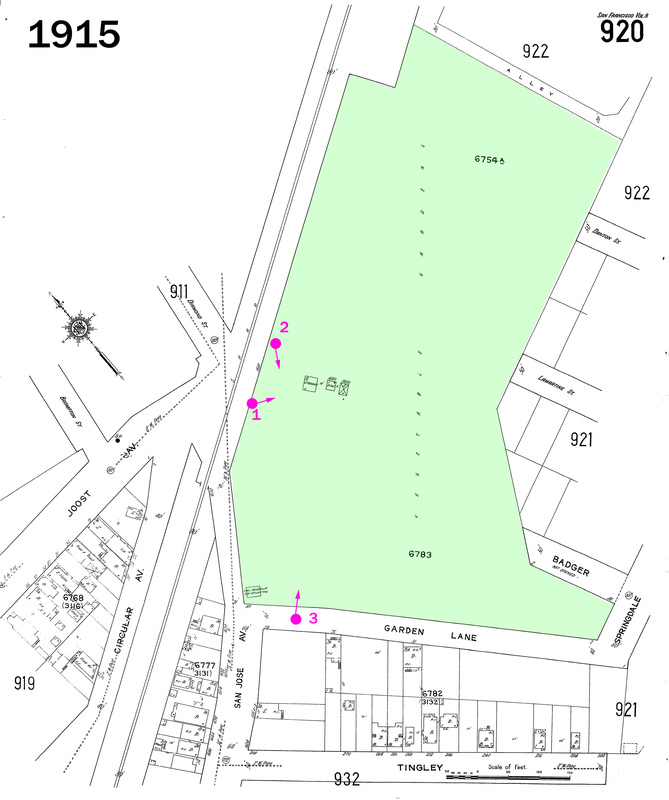 Vegetable gardens area of 1915 Sanborn map marked here in green. In the early 1940s, over one hundred houses were built on this plot of land–two bedroom, thousand-square-foot homes similar to ones being built all over San Francisco then. These show up on the 1950 Sanborn map. 1950 Sanborn map, sheet 920. Same area of vegetable gardens on 1915 map marked here in green. Over 100 houses built in early 1940s. 2017 Google street view of NE side Gorham Street. All the houses built on the plot were of this vintage, and these few are still standing today. However, with a few exceptions, these houses stood for only about 20 years. The construction of the Interstate 280 freeway meant the city bought the land and people were forced to give up their houses for minimal reimbursement. Some houses were hauled away to open lots elsewhere. The freeway cut through Balboa Park as well, following the line of the old Southern Pacific tracks. This was just before the freeway revolts that prevented such construction through parks and neighborhoods elsewhere in San Francisco, such as the Panhandle and Glen Canyon. The 1990s Sanborn map below shows the ranch/farmland area as it is now, with multi-layered ribbons of concrete and pavement. A few of the 1940s houses are still standing on Gorham and Badger Streets. 1990s Sanborn map, altered to show same planted area from the 1915 map. Google Earth view of the area now. View larger. Note for clarification: Land used for dairy farming in what is now Glen Canyon was also called “Rock Ranch” in some contexts, such as the 1869 account* of the explosion of the dynamite factory there. In the 1887 directory the dairy rancher at Glen Canyon (Reed) listed her address as “Rock Ranch near Chenery,” while the other rancher (Harrison) listed her spread as “Rock Ranch near the Old San Jose Road.” In 1891 dairywoman Melissa Huff listed her address as “Rock Ranch, Old San Jose Road.” In 1875 a milkman is listed at “Rock Ranch near Bernal Station” [near San Jose Ave and Roanoke now], as a variant. * “Fearful Explosion,” SF Chronicle, 27 Nov 1869, p5. I can’t thank you enough for this. Excellent article, thank you for using the OpenSFHistory images. This is great great work. Thank you for this. I live on Santa Rosa Ave. and seeing the area before all the homes were built is truly amazing! Thanks! You can see more local photos by searching on ‘santa rosa’ at http://opensfhistory.org.